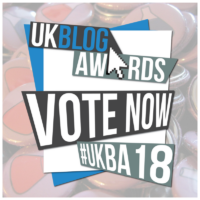 Just a reminder that you can still vote for this blog in the UK Blog Awards until Friday of this week. It only takes a few seconds to vote, and you can vote for two blogs in total. There is not going to be a post next week, because I will be on holiday and/or working to prepare for the “Science to SciComm” workbook launch next month. More on that below! If you want something to read in the meantime, here are the five most-viewed posts of the past year. Actually, the post with the most views in 2017 is still one the one that went viral last year. The explanation of the GIF of the walking molecule remains the most popular. The workbook based on the series of posts about transitioning from a research career to full-time science communication is almost done. Launch is planned for mid-January, so stay tuned for updates on that. To make sure you don’t miss it (and to get a discount code), subscribe to the monthly newsletter. The December issue has already been sent out early, so the next one will be out in late January.